You are struggling with completing an assignment and browse the Net, looking for a perfect service to complete the paper for you. In case you are considering trusting essaypenguins.com to do it, you might be wondering: Is Essay Penguins a legit service? Is it safe to use? Will you receive what you are expecting to receive? Hopefully, this Essay Penguins review will help you to decide. Essay penguins reviews that are based on the customer’s feedbacks show, that the price and the quality of the paper do not always correspond. The website offers you basically any service the writing agency can complete. You can order any academic writing (all kinds of essays, term papers, case studies, book reviews, lab reports and mathematical and physical problems solving), as well as you can place an order for editing, rewriting or proofreading the existing paper. The agency can also help you write your CV or resume, will provide you with admission services assistance and can complete multiple choice tests with or without time limits. 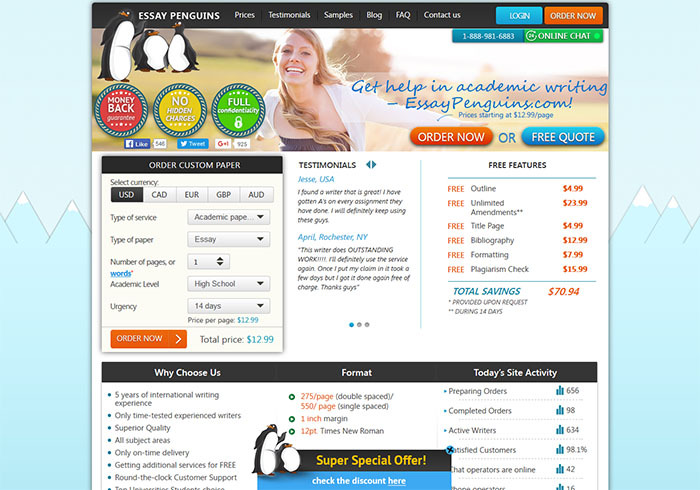 Essay Penguins reviews can show, that the price quote is average. It is higher, than on most of other websites, so even though it might seem affordable upon first impression, there is still an opportunity to get your paper done having paid less, as the market is wide. The prices for completing the paper with Essaypenguins start with $12.99 per page and depend on the academic level, the type of service and the deadline you set. For example, calculations will cost you starting from $19.99 per page, and completing a resume will be charged for $89.95 for a 5 days deadline. When you place the order, you only pay for the number of words. All the formatting, the title page and the reference page will be provided without any additional charges, and these are the only additional features provided. In case on any complaints, they have a working revision policy. You are offered a special 15% off discount for your fist order, a banner with a discount code appears on the bottom of the page. After this, the discounts are offered only for the amount of pages completed with the website, starting from 5% off for 15 pages completed for you or over 399$ spent for the company’s services. Special discounts for holidays can be also offered, so you will need to check the website for a code. After you spend a minute on the Essay Penguins website, communication in chat online is offered to you. It can be quite distraction, as the window keeps popping out whenever you click on something. The questions is why, as most of the answers the team provides you with are directions on where to look for the information on their website, plus you need to wait for a while to get them. Apart from this, you can contact the team via the toll-free phone number or send an e-mail to support@essaypenguins.com.